If suffering from thyroid disease, how can we bring our bodies back to balance and energy? Especially when the thyroid is the metabolic and hormone control center for the entire body? Most importantly, treatments must be individualized. Patients have unique health histories — not to mention, thyroid conditions are complex. A practitioner must test and evaluate a patient to provide them with the best treatment. That said, there are general principles and supplements that benefit the thyroid and immune system of most patients. Discuss these with your practitioner, and conduct your own research. Alan L. Rubin, MD, author of Thyroid for Dummies, says, “Every organ in your body requires thyroid hormone to function normally. When that hormone is lacking, the organs tend to do less of their usual functions” (source). It's very important to support the thyroid. In doing this, you support the entire body. So, how do we accomplish this? Enhance T cell function (source). Triggers include removing gluten from one's diet, keeping stress at a minimum, and working towards healing leaky gut. Heavy metals can also trigger Hashimoto’s, causing an overactive immune response. Ask your doctor about being tested for heavy metal antibodies. Additionally, both pregnancy and perimenopause cause surges in estrogen, and may trigger an auto-immune response. Check out this post for more information about balancing estrogen during perimenopause. 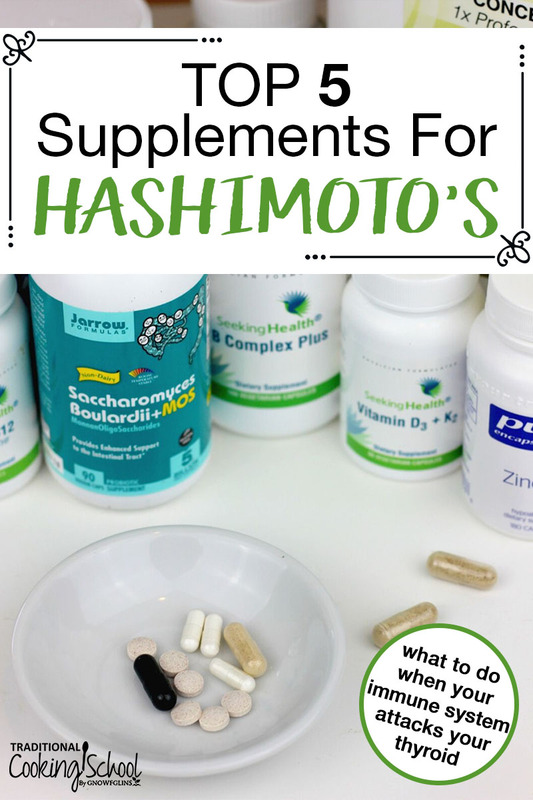 Now let's look at the top 5 supplements for Hashimoto's, and the complex network that affects thyroid health. Each probiotic strain carries out a unique role in the body. So, in choosing a probiotic supplement, it is often due to the role it will play in our physiology and wellness process. Saccharomyces boulardii does not colonize the gut wall. Instead, it passes through the gastrointestinal tract, protecting against pathogens and infections such as H. pylori, which has been linked to Hashimoto's. This probiotic also reduces inflammation, directs T cells to support thyroid function, and aids gut conversion of T4 to T3. 20% of the body's T4 to T3 conversion occurs in the gut. Finally, Saccharomyces boulardii is affordable. Did you know that iodine deficiency is the leading cause of hypothyroidism globally? That's because iodine is required to create thyroid hormone. Most patients who cannot tolerate iodine simply have a selenium deficiency. It is important to note, however, that a minority of patients can't tolerate iodine even with selenium supplementation. Read more about iodine dosing, the recommended 24-hour urine loading test to determine iodine levels, and which labs do the test here. In addition to balancing iodine, selenium assists the liver with T4 to T3 conversion and degrades reverse T3. It also decreases autoimmunity and inflammation. For these reasons and more, selenium supplementation is universally recommended for thyroid health — regardless of whether one tolerates iodine or not (source and source). I supplement with selenium by taking a full dropper of high-quality liquid soil mineral, 3 times daily in water or tea. For those who prefer selenium in supplement form, most practitioners recommend 200 to 400 mcg daily (source). Low Vitamin D3 levels are not only associated with hypothyroidism — they worsen the condition and other auto-immune diseases in general (source). What does Vitamin D3 do? It helps with T cell regulation and is also anti-inflammatory. And yet, it needs Vitamins A and K2 present as well, in order to support calcium regulation and prevent D3 toxicity (source). My family uses this supplement, with K2 present. Practitioners often prescribe 5,000 to 10,000 IU daily for patients with a deficiency. Ask your doctor to check your levels to determine short and long-term dosage, aiming for a range of around 40 to 50 ng/ml (source). Zinc helps convert T4 to T3 too, and its absence is associated with poor T3 conversion. It's also anti-inflammatory, reduces antibodies, and boosts the immune system. 30 to 60 mg daily is recommended. If taking the larger dose, take half with breakfast and half with dinner. First, let's talk about Vitamin B6. 2 metabolic pathways in the liver affect assimilation of thyroid hormones. Both Vitamin B6 and magnesium help to support these liver functions and detoxification. Normal and healthy brain function also relies upon Vitamin B6. Because leaky gut is often associated with thyroid conditions, and the gut-brain axis is well known, many who suffer from thyroid conditions also notice “foggy brain” symptoms. Most, if not all, thyroid patients also suffer from adrenal fatigue. Holistic practitioners often prescribe an adrenal supplement that includes Vitamin B6, like this one — which helps to restore normal cortisol and energy levels, as well as improving sleep. Improved sleep means reduced inflammation. Other thyroid patients get their Vitamin B6 in a glutathione supplement, such as this one (source). Hypothyroid patients are also notoriously low in Vitamin B12 — up to 40% according to one study! This often results from low stomach acid, which in turn means poor nutrient absorption. In this video, I discuss the importance of choosing Betaine HCl or digestive bitters to amend stomach pH. Vitamin B12 supplementation also often improves energy levels and mental cognition. Talk to your practitioner. Some patients need only supplement with B6 or B12. Others receive B6 in their adrenal support, and B12 from a separate sublingual supplement or even injections. I personally benefit from a B complex vitamin for overall support of detoxification pathways, improved energy, and mental function. I'm also currently exploring the use of Vitamin B12, and am amazed at the level of energy and restoration it's given me! Check out this excellent post on the topic, citing one doctor's use of this supplement and the improvement he saw in 60 to 70% of his patients. Are Any Other Supplements Worth Exploring? Yes! At least 10 other supplements to support the thyroid are worth considering for certain individuals. Read about those supplements here. I discuss the role of glutathione, fatty acids, Vitamin A, iron, and several others. Chris Kresser warns that not all supplements that affect the thyroid will benefit the thyroid. Unless recommended by an immunology specialist specifically for your body, Kresser advises those of us with thyroid disorders to avoid green tea, Gotu Kola, echinacea, and astragalus (source). Have you experienced thyroid healing through supplements? Which ones made a difference? One of the big reasons that some people react strongly to iodine–thinking they’re allergic to it–is they have high levels of bromine, fluoride and/or chlorine levels in their bodies. Bromine interferes with iodine uptake and utilization in the thyroid gland as well as wherever else iodine would concentrate in the body. When there is an iodine deficiency present, bromine toxicity will be exacerbated. In addition, bromine can bind to the transport cells for iodine (sodium-iodide symporter–NIS) and damage the transporter cells. Bromine also competes with iodide for absorption and uptake in the body. A low-salt diet will exacerbate bromine toxicity. Unrefined salt is an effective tool to help lower bromine levels in the body. Fluoridation, as I understand, is inflicted upon around 70% of the people in the U.S. This poison inhibits the ability of the thyroid gland to concentrate iodine and it’s much more toxic when there is iodine deficiency present. Fluoride is among the goitregens that can bind to and damage the NIS and so less iodine is transported into the targeted cell. The others are perchlorate (very common in this country), bromine, thiocyanate (from cigarette smoke). Chlorine, as opposed to chloride, is a beneficial member of the halide family that can competitively inhibit bromine and help the kidneys excrete bromide. Chloride is also an important element in the extracellular fluid. Chlorine is a toxic element. There is also a chloride/iodide transporter known as pendrin. Iodine may be absorbed through the intestines resulting in an elevated serum level of iodine, but the target cells are unable to uptake the iodine. This can occur if the NIS and/or the pendrin transporter systems are damaged. Fluoride and bromine are in many pharmaceuticals. Bromine replaced iodine in commercial baked good back in the ’50s. We used to be getting some decent levels of iodine in baked goods before that. Another good source of selenium is whole grain breads, naturally sourdough risen. The fact that so many are now unable to eat wheat/gluten is quite interesting to me. The usual remedy is to stop eating the offending foods and improvement ensues but it isn’t permanent and more foods become “offenders” until the person can eat almost nothing without serious health issues. I read a very helpful book addressing this issue, Eat Wheat: A Scientific and Clinically-Proven Approach to Safely Bringing Wheat and Dairy Back Into Your Diet, by John Douillard, DC. His observation is that merely removing difficult-to-digest foods is not a solution because there has been gut damage and usually extremely low levels of microbiome organisms to allow proper digestion to occur. His advice, program, information and resources guide those who see the wisdom of this. Anyway, I thought you might not have come across this information. Thank you, Ellen for your comments. I am looking into the book by John Douillard as it seems strange to me that people ate wheat and dairy for thousands of years and now we are told not to eat these nutritious foods. I have been watching The Thyroid Secret series, and although I am sure they all mean well, I cannot agree with cutting out entire food groups. You are left with very little that you can eat and end up leaning on supplements instead of food for your nutrition. Those that follow such a regimen must have a very expensive food bill. These are not the grains and foods our ancestors ate long ago….they have been mutated and messed with so bad….that it is no wonder we are sick. Our ancestors ate the whole grain, and it was soaked or fermented. Most flours we get our not a whole lot more than starch and a starch with a lot of toxic side effects. Not bad enough to kill you immediately but in tme….bit by bit, yeah Many of these foods actually deplete the few vitamins and minerals that we are getting from our food. As to more expensive than normal….oh I guess some.. My family has been gluten and casein free for over 15 years. I have had to learn to cook again…well many times…because of allergies…but if you cook from scratch and leave the crap you find on the make it easy for dinner isles and the breakfast cereal isle and the canned stuff alone….it isn’t much more. I shop at Azure Standard for my bulk items….coconut, nuts, beans and grains. We eat a lot of fermented foods and yogurt. These all help and if made at home, are not really expensive. I make coconut yogurt and cashew cheeses and almond milk….all pretty economically. It all comes down to what you want to do and what you are willing to do. It makes you learn to be creative and open minded when it comes to food. You’re welcome, Audrey. While it’s true that our food has been greatly adulterated–pesticides, herbicides, fluoridated, irradiated, GMOs, hybridized–we still have the opportunity to heal our guts (and yes, omit those foods for a time until the healing occurs). We have the choice to choose the best we can find and ferment what we can, including sourdough breads. Often, folks who are sensitive to gluten can eat sourdough breads just fine (and stop vaccinating; causes great damage to nervous system and gut). Best to you. Many of us, also, have impaired guts…..and K2 is very very hard for many of us to use…causing excruciating pain in the gut that is hard to get rid of (I used high doses of L glutamine to repair mine but it took a while) I found that I could get it better one of two ways….either in foods….lots and lots of cauliflower and broccoli, or by buying K2 in liquid form and rubbing on skin. Sac B is also sometimes problematic because of the immune system issue and the trickle down theory that follows: allergies, leaky gut and of course the real villain…..systemic candida. Even removing sugar and most carbs will not take care of the issue….as the problem is like an octopus with many arms reaching out and causing more. Also one of the things you might also consider is that K2 and D3 are two very important elements in the proper uptake of calcium…and add that to the rampant serge in the population of b12 and magnesium deficiencies….you have a real mess. Osteoporosis and osteomalcia are everywhere…not just among the elderly…these two in and of themselves can disrupt the body so badly….and which also sets the body for either a potassium imbalance…and that is our electrolytes….how can you be healthy if your basics are corrupted….not happening. It is a very complicated issues….multipronged and none can be missed as it creates more. I’d like more info. Thank you! Please Help! I am so confused about iodine! I thought it was bad for Hashimotos. I stopped using iodized salt and seek out multi vitamins without it. Dr. David Brownstein’s book, “Iodine, Why You Need It and Why You Can’t Live Without It” is an excellent resource for that very question. I would search a functional medicine practitioner for help in your healing. Conventional practitioners have drugs, surgeries, chemo, radiation and more drugs to offer. These do NOT heal. Best to you. I agree with most……but I would caution the use of Vit K2…….it is often not well tolerated with people with gut issues….causing extreme distress….I had to put it on my skin for a long time…. We don’t use Lugol’s anymore…we use nascent. It seems to work better and faster and longer for us…. We use Magnascent as it seems to be the best one out there….none of them are cheap….but this one is the best, to us. Also we don’t just put it in the mouth….we put it on sores or injuries….gargle with it….it goes everywhere…does help with skin issues and such….you can tell how your levels are by just putting on the skin and seeing how fast it disappears…..that yellow color… Also some folks with the bromine, fluoride and/or chlorine issues, can put drops on their skin instead of the mouth and have less reaction. start with 1 drop daily and work up to 10 or so…and then try a drop in the mouth….helped us. Also we found with the problems we faced….that switching to P-5-P instead of B6 worked wonders….many people with injured guts have issues with B vits and need to step back to the precursors.